Known around the world for inspiring fun, Airheads and Mentos delight kids and adults alike. Airheads candy is an instant smile inducer! With a variety of intense fruity flavors and soft chew, Airheads transformed candy forever. Whether you like them regular size, minis, big bars, or in bite-size pieces, Airheads is a taste explosion! Across the country and around the globe, Mentos has been delighting people for more than 80 years. You love the delightfully refreshing mint and the fruity flavors of Mentos and Mentos Gum. Mentos rocks! Consumers in more than 150 countries around the world enjoy Perfetti Van Melle confectionery and chewing gum products. Whether it's children enjoying the bubbly wonder of Chupa Chups Magics lollipops filled with apple mango fizzy powder, or teens enjoying Alpenliebe’s chewy caramel goodness, we deliver happiness and joy all across the globe. Innovation, creativity and quality – these traits mark the Perfetti Van Melle commitment. Since 1958, Chupa Chups has delivered happiness and smiles to children of all ages. Tradition, originality and extraordinary candies and gums have taken Chupa Chups into a new era, combining the strong Chupa Chups tradition with our commitment to contemporary creativity and innovation. 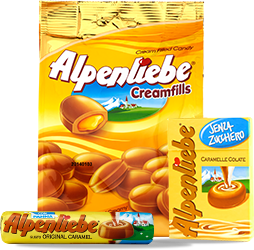 As a trusted brand with European roots, Alpenliebe is known for its exceptionally smooth and creamy, melt-in-your-mouth qualities. People around the world show their loved ones how much they care by sharing Alpenliebe candies. Alpenliebe—bring hearts closer. Learn more about Perfetti Van Melle’s regional brands on our global website.